Ever wished you could create your own Photoshop filters? Well, you can with Filter Forge. Now, I am not talking about another set of Actions. Filter Forge is a real Photoshop plugin which lets you create your own filters and edit an existing library of 6000 user-contributed Filter Forge filters. Very cool! Each existing filter has enough settings to customize and tweak even with just the Starter and Basic Editions. Filter Forge is support by a very active user-community and forum. There are competitions to create new filters earning upgrades and free licenses, so new filters are released on a weekly basis. To get a real idea of the breath of Filter Forge, you need to browse through the Filter Library. 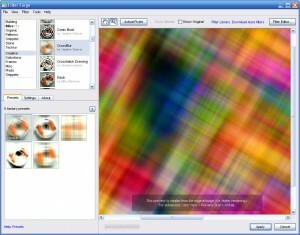 The top group of “Texture Filters” create new images while the lower “Effect Filters” are applied to the selected Photoshop layer. If you ever use textures or background images, Filter Forge will be a great texture generator. Since you can tweak the filter settings and colors, you can customize the output to meet your needs. The Photo effects like Grunge, Gritty, Grain and Real Contrast are very powerful. There is even a Bokeh effect called Low Focus. Just run a search for an filter and see. I encourage you to download the 30-day trial version. Currently, it is only available for the PC, but a Mac OS X edition is in production. You may never need to buy another filter!